Note: This article was published by the Small Farmers Journal in their Winter 2011/2012 issue. Last spring I put a handle on a curious gardening tool I picked up – more by accident than intent – at the FALCI company in Italy. Ashley, our 17-year-old (a seasoned gardener and enthusiastic digging fork user), was first to try it. She went to deep-till some carrot beds in what mostly was years’ worth of compacted compost, as well as in our new “pasture garden” where, after one rough plowing a year ago with livestock having free access interim, we planned to make a sort of pioneer-style corn and potato patch using only hand tools. We also wanted to see how few tools are really necessary to accomplish the task, yet do it well. She came back excitedly in a rather short time with a request: “Call to Italy right away and have them send us more of these.” “These” are the Magna Grecia hoes, popular in the Calabria region of South Italy but, interestingly, known in very few other places. The head weighs 1250gm. From eye to tip the tines are 30cm long and the tough, well-beveled chopping blade on the opposite side measures 7 by12cm. The two lanky tines may appear odd – but whoever designed this tool must have understood something about the dynamics of soil penetration that many others apparently have not. 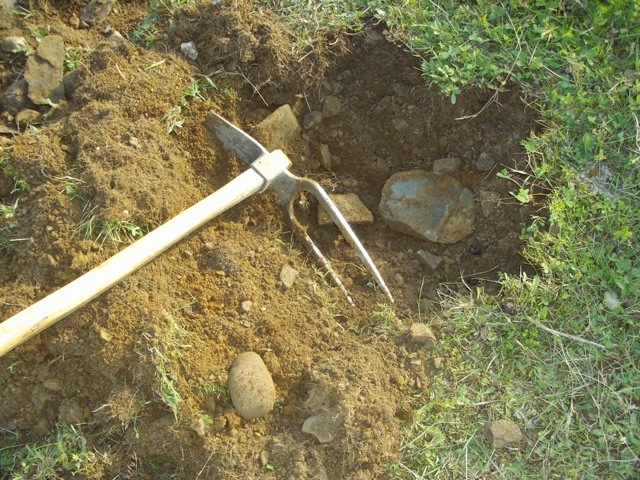 We do have other pronged hoes, but I would not have imagined, until the experience with this one, a hand tool to penetrate into soil with such ease – nor be capable, after each swing, of aerating/lifting/moving the amount of earth the Magna Grecia hoe does. The secret must lie in its particular geometry: the gradually tapering prongs (most pronged hoes do not have this taper) and just the right distance between them, so that even our rather loose soil does not, for the most part, slip through. I should perhaps also explain that most of the rocks comprising this otherwise light loam, are actually relatively small (and not readily apparent in the videos). Nevertheless, it does not take much of an imbedded rock to effectively stop the penetration of a wide-bladed tool; hence the “uselessness” of digging spades in this neck of the woods. In any case, in one of our tougher test spots (a rocky pasture, in sod for over 20 years), a 6 inch wide square-face hoe penetrated barely 2 inch deep with approximately the same force that sunk its pointed equivalent 4-5 inches and the Magna Grecia 8-10 inches. And while loosening the second (deeper) layer, the first two hoes were made fools of along side of the two-pronged workhorse. The garden forks (the border and the standard versions) did, after appropriate wiggling, penetrate to their respective maximum depths, but both required more time and effort than the Magna Grecia hoe. Another peculiar thing we’ve become aware of while comparing the square-bottomed as well as the pointed hoes with the Magna Grecia is that in any other but very loose soil the first two designs give the arms a slight jar whenever they reach the end of each swing’s penetrating depth. The pronged hoe feels different; even when driven up to its neck into the ground, there appears to be some “magical” cushioning effect. Consequently it causes notably less fatigue during extended use. (However, this is a radically different digging tool than North American gardeners are used to, and notwithstanding the fact that we are so thrilled with it, it may not be for everyone….please read Note – below). Secondly – after a full season of testing the Magna Grecia — I think that if the concept of EROEI (Energy Return On Energy Invested) were applied to a movement with a gardening tool –the goal being to penetrate, loosen and partially prepare the soil so that seeds could (after some version or another of surface preparation) be planted — this unusual two-pronged hoe would outperform most, if not all other hand digging tools presently sold in North America. This is no small issue – because a question must be raised: How much endurance do we have as a future nation of gardeners, and how much energy at our disposal? That remains to be seen, though there will likely be very little, if anything to spare… We will also, by necessity, be starting thousands of gardens from scratch, many of them in “marginal” places. Furthermore, I have an uneasy feeling that the plethora of tools we’ve learned to take for granted may not be always readily available. We have, in recent decades, lived like spoiled children with too many toys, and it would be foolhardy to assume that this can go on forever. The manufacture of the majority of our hand tools has already been outsourced overseas, with hundreds of former US and Canadian factories gutted and now devoid of equipment – because the economic model of the day dictated that it be so. a) it has depreciated the inherent value of tools in general. (The value of a shovel – in the mind of the average consumer – has come to be $9.99 or thereabouts. If someone, for instance, breaks its handle, the whole tool often ends up in the dump because “it is cheaper” to walk into one of the superstores and buy another complete tool than to replace the handle. The individuals who, for the time being, most benefit by this attitude are the shareholders and CEOs of the corporations importing shovels from India or China to North America). As for the “benefit” of fewer rather than more tools alluded to earlier, I see it as an issue of conservation ethic, as well as solidarity. 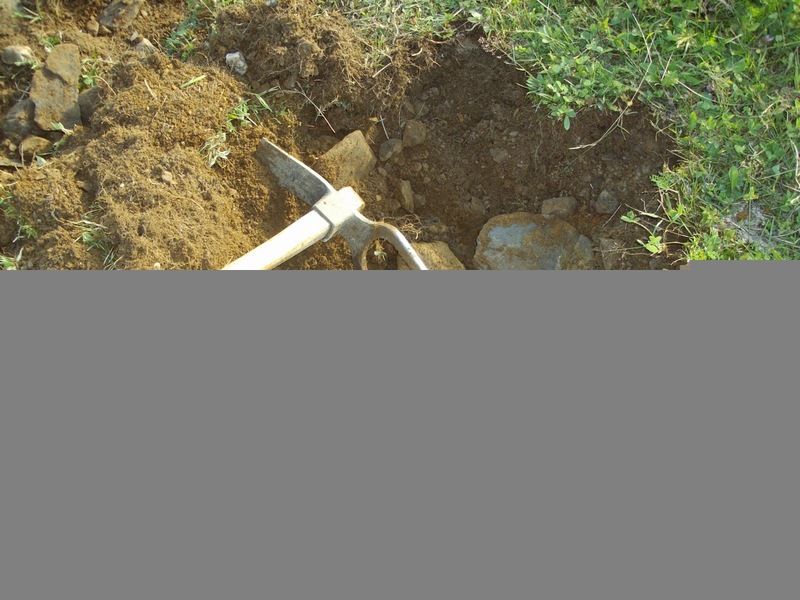 Throughout much of agricultural history – and, in many regions of the world still today – a farmer/gardener has (or can only afford) but ONE soil-working tool. Whether we willingly choose to preserve resources or express solidarity, having a shed full of non-essential tools will likely not always be an option for most of us… and certainly not for our children. Interim, while the present infrastructure still functions, one of our urgent tasks may well be to drop some preconceptions of what is adequate/sufficient/necessary, while seriously exploring unconventional concepts, tools and ways to use them – in many areas beside gardening, of course. In general, a pronged hoe requires more “tool sense” (i.e. the sense to recognize the strength limits of the tool BEFORE it is seriously damaged) from its user. This may be the obstacle in making the Magna Grecia (or a hoe of similar design) popular among the relatively new North American gardeners/small farmers/homesteaders — many of whom appear to lack this sense. The challenge here, in principle, is the same as with garden forks — the bending of their prongs is far more frequent than damage to spades (manufactured to the same quality specs by the same enterprise).